Montenegro's wild landscapes, azure seas and rich cultural heritage are the compelling indulgences that greet adventurers in Europe's most bewitching of countries. Montenegro's magnificent Dalmatian coastline has long been world renowned, attracting movie stars and monarchs to the dazzling blue green seas. The Bay of Kotor is credibly one of the prettiest bays in the world and is lined with many stunning destinations: from the vibrant and contemporary Budva Riviera to quaint and serene Vipazar. Castles, fortress walls, and quaint fishing villages, tucked between orchards and the sea make for a very picturesque cycling expedition. Vast inland mountains with majestic grandeur give unrivaled panoramic views into a largely uninhabited interior and across dramatic wild forests. There is now a renaissance among travelers as the memories of crippling past troubles fade, and the beautiful uniqueness of the country draws excited audiences once more. Meet at Dubrovnik Airport and transfer to the old royal capital town, Cetinje. The route is beautiful to Lake Skadar, one of Europe's best bird watching sites. Take a rest in Rijeka Crnojevica before moving to the fishing village of Virpazar with a ride through a famous wine region. We cycle along Lake Skadar, with lovely landscape views. A final descent takes you to Ulcinj, one of the oldest settlements on the Adriatic coast, dating from the 5th century BC. We cycle south to the coastal town of Old Bar, stopping at the Old Olive of Mirovica, one of the oldest olive trees. We can wander around the alleys and discover the historic buildings before transferring to Budva, a picturesque coastal town. Transfer uphill to Cetinje to start our ride towards Lovcen National Park. We hit an old wagon trail and go over the Trešnja Saddle. Another pleas-ant riding section is exploring the military road around Bogojeva Glava, climbing to the mountain pass of Krstac and riding on to the Old Town of Kotor, a UNESCO World Heritage Site. We cycle, exploring the Bay of Kotor, with a gentle round trip along its coastline, and from Kamenari, we have a few options. Before our last section along Dobrotato, we head to Our Lady of the Rocks. Before our last day, we tour Lustica for great views, for a taste of olive oil, and for a chance to swim. Before a farewell seafood dinner, we still can do more sightseeing. Airport transfers for onward travel. Kristin and I recently returned from the most wonderful trip we've ever had. 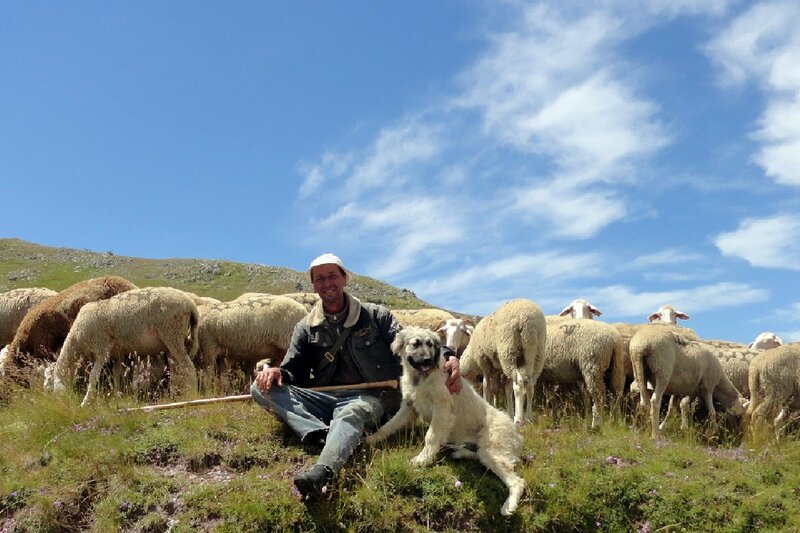 I wanted to let you know how happy we were with your help and with introducing us to Zoran, our new friend. Spending the week with him would have been fun enough, but adding the beauty of Montenegro from those mountain views was beyond imaginable. We ride a total of 358 km in 6 days of cycling. Most of our tour is on tarmac, but there are stretches on former Austro-Hungarian military trails which can be rocky. The terrain is mountainous, so we will be climbing and having thrilling descents every day. The distances aren't long, but the days will be full. On this trip there is a lot to see along the way. Suitability: This trip is suitable for anyone with a reasonable level of fitness and some off-road riding experience. This trip is not too arduous, and so riders with less experience are more than welcome, although the fitter you are, the more you will enjoy it. Biking Conditions: This trip includes ascending every day. On a few sections, there will be minimal vehicle support, but we will be met by a vehicle at meeting points when possible. Arrival and transfer to the old royal capital of Montenegro, Cetinje. After an introduction to the tour and adjusting your bikes, you have time to stroll around town, before a welcome dinner. We have a beautiful cycling route to the biggest lake of the Balkans, Lake Skadar, one of Europe's best bird watching sites. Have a rest in Rijeka Crnojevica before you continue to the fishing village of Virpazar, another stunning Montenegrin jewel with a population under 400. We also ride through Crmnica, the most valuable wine region in Montenegro. We cycle along the shoreline of Lake Skadar. We have views of monastery islands, fishing villages, and chestnut groves, and all the time, you have great views of the lake and the Albanian Alps. A final descent takes you to the city of Ulcinj, one of the oldest settlements on the Adriatic coast, dating from the 5th century BC. The old town castle was built by the Illyrians and Ancient Greeks. We cycle south from Ulcinj to the coastal town of Old Bar. In the first section of today's ride, we pass the resort town of Donji Stolj and continue cycling next to salt flats. Just before Old Bar, olive groves line our path, and we stop to visit the Old Olive of Mirovica, said to be one of the oldest olive trees in the world. We have free time in Old Bar to wander around the alleys and discover the various historic buildings before we transfer to Budva, an incredibly picturesque and vibrant coastal town. We have a transfer uphill to Cetinje to start our ride along the old road towards Lovcen National Park. From Ivanova Korita, we ride along an old wagon trail to the foot of Jezerski Vrh and over the Trešnja Saddle to visit the old spring in Sanik. Our route descends towards Bukovica, where we grab some refreshment at Kod Pera, a café that has been open every day for more than 100 years. We explore another military road around the Bogojeva Glava mountain, before our pleasant downhill to Njegusi. It’s one last short climb to the mountain pass of Krstac, before we ride down the well-known Lovcen Road to the Old Town of Kotor, a UNESCO World Heritage Site. Kotor is well-known for its stunning architecture and beautiful setting in a secluded part of the Boka Kotorska Bay. Stari Grad (Old Town) is a labyrinth of cobbled lanes linking small squares containing ancient churches and old aristocratic mansions. We explore the Bay of Kotor, which is a gentle round trip along its beautiful coastline. From the settlement of Kamenari, you can ride over Lipci and Gornje Ledenice to Risan, or you could cycle to Herzeg Novi and back. In Perast, we take a return boat trip to visit the church island, Our Lady of the Rocks. The final section is along Dobrota back to your accommodation in Kotor. Today's tour takes us to the peninsula of Lustica at the entrance of the Bay of Kotor. Enjoy great views of the fortification islands, the bay, and the Adriatic Sea. Have a taste of the olive oil produced there and take the opportunity to have swim at one of the beaches. We have enough time for sightseeing in the old town before a farewell dinner packed with seafood specialties. We will schedule transfers to Podgorica, Tivat, or Dubrovnik Airports depending on flight times. Because some people can't imagine going on a trip without their own beloved bicycle, we do not provide them as part of this tour. However, you can hire bikes locally for the price listed in the tour pricing section. The bikes are well-known mountain bikes with lightweight alloy frames, 24- to 27-speed gearing, v-brakes, and Shimano components and front suspension. If you bring your own bike, please make sure it is a mountain bike, preferably with front suspension, in good mechanical order. Citizens of the EU member states and citizens of the signatories to the Schengen Agreement may enter the territory of Montenegro with a valid ID card issued by the competent authorities of the concerning countries. All remaining nationalities require a valid passport for entry into the country. Please ensure your passport is valid for at least 6 months from date of entry. If staying less than 90 days a visa is not required for nationals of more than 90 countries. Please check the Montenegrin government website for details applying to your status. The same applies for transiting through Croatia. In Montenegro it’s possible to reach an altitude of 1700 m within 10 km of the coast, so wild variances in climate are to be expected. Chillier temperatures are probably at higher altitudes. Like most of the Mediterranean region, Montenegro’s coast enjoys balmy summers. The warmest months are July and August, when the temperature ranges from 19°C to 29°C (average lowest to average highest). And just to let you know – the summer sea temperature is 25°C to 28°C. Meals are included as per the itinerary where B = breakfast, L = lunch, D = dinner. In addition to the standard European and Mediterranean cuisine, Montenegro offers a variety of healthy food products and local specialities. Cold hors-d'oeuvres include the famous njeguški pršut (smoked ham) and njeguški cheese, pljevaljski cheese, mushrooms, donuts and dried bleak (carp family). A selection of traditional recipes of the central and coastal parts will include the kastradina (dried mutton), smoked and fresh carp (from Skadar Lake) and a variety of fresh sea fish and seafood dishes. We shall make sure you sample a large variety of local cuisine. Any special dietary requirements can also be catered for as well. Please let us know at the time of booking. Keeping you completely hydrated is a job we take very seriously. Cold water, some energy-restoring local fruit and soft drinks are included in the tour price while riding. Soft drinks and other beverages during meals are not included. But you may also want to bring electrolyte in powder or tablet form. Alcoholic drinks are available everywhere, but are NOT included in the price. We recommend that you tuck away a few extra Euros for possible incidentals that might arise. It is always wise to have some paper currency in case of ATM absence or credit card problems. This will save you a lot of unnecessary worries. It is also customary to tip local tour guides and drivers; however, the amount you give should be dependent on the level of service you receive. As a general guide we suggest that €5-10 per person per day is appropriate. 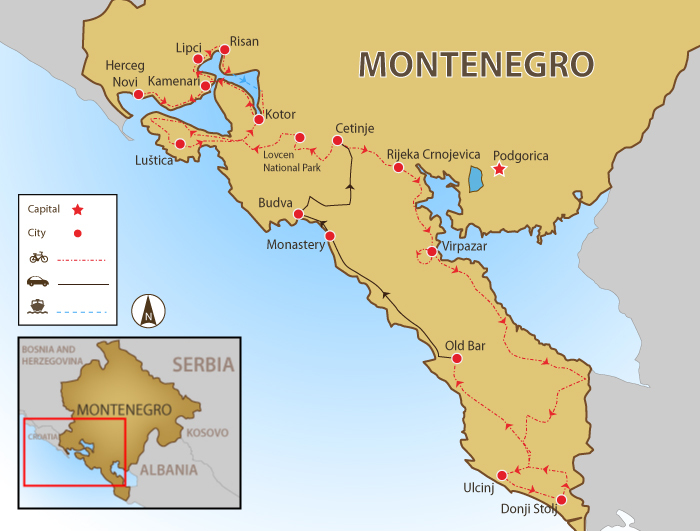 Montenegro is the nation that adopted the euro as its official currency.